Black crop top, thrifted; vermicular print shararas, by Rashmi Varma; black patent leather booties, from Versace; flapper hat, from Barbara Feinman Millinery. Chef and owner of Chez Nini; author of the coffee-table book Eating Stories; soon to pursue a six-month course at the National Gourmet Institute in New York; New Delhi. A lot of high-waisted everything. Rashmi Varma, Comme des Garçons, Dear Rivington (their own label) and Japanese designer Yohji Yamamoto. Invest in your body; for me it’s Barry’s Bootcamp classes in New York. Wear the walk of shame with pride. 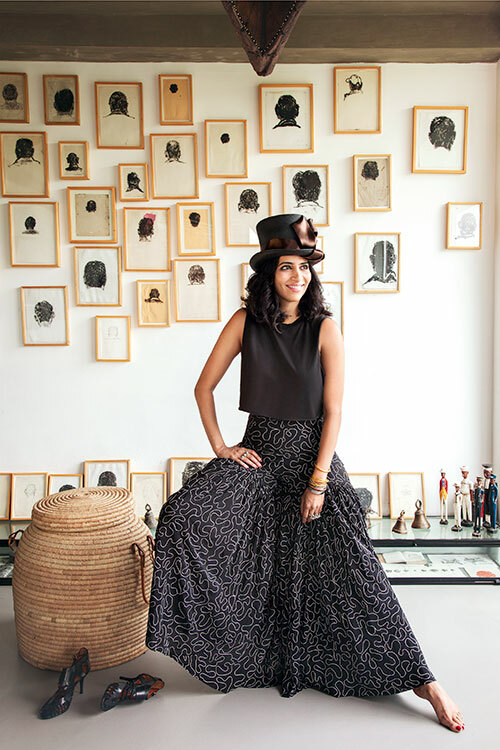 Asha Putli’s record — 1001 Nights Of Love. Tinted lip oil from Yves Saint Laurent, wireless earphones and the book that I keep reading over and over, The Untethered Soul. My work isn’t really fashion-restrictive, unless I’m actually in the kitchen. Then I guess it’s about the least flammable clothes possible, but no uniforms…ever! Sneakers for comfort all day, and maybe one of my amazing Barbara Feinman hats. Shaving my hair off; big release from vain obsessions with our looks.